JPO’s acknowledgement of the numerous issues are fine as far as it goes, but there’s no indication that the office has any plan — including cost and schedule re-estimates — to fix those currently known problems without cutting corners. Nor, apparently, do they have a plan to cope with and fund the fixes for the myriad unknown problems that will be uncovered during the upcoming, much more rigorous, developmental and operational tests of the next four years. Such a plan is essential, and should be driven by the pace at which problems are actually solved rather than by unrealistic pre-existing schedules. What will it take to fix the numerous problems identified by Gilmore, and how do we best move forward with the most expensive weapon program in history, a program that has been unable to live up to its own very modest promises? The F-35 is being sold to the American people based in no small part on its mission systems, the vast array of sophisticated electronics on board the jet. A quick perusal of any of the hagiographic articles about the F-35 will find that they nearly always point to its capabilities to gather massive amounts of information. This process is designed to allow the pilot to dominate the battlespace. Based on the actual test performance of these systems during developmental testing, however, it appears the electronics actually interfere with the pilot’s ability to survive and prevail. Overall, problems with the F-35’s sensors, computers and software, including creating false targets and reporting inaccurate locations, have been severe enough that test teams at Edwards Air Force Base have rated them “red,” meaning they are unable to perform the combat tasks expected of them. One system, the Electro-Optical Targeting System (EOTS), was singled out by pilots as inferior in resolution and range to the systems currently being used on legacy aircraft. EOTS is one of the systems designed to help the F-35 detect and destroy enemy fighters from far enough away to make dogfighting a thing of the past. Mounted close to the nose of the aircraft, it incorporates a television camera, an infrared search and track system, and a laser rangefinder and designator. These sensors swivel under computer control to track targets over a wide field of regard and display imagery on the pilot’s helmet visor display. But the limitations of EOTS, including image degradation with humidity, force pilots to fly in closer to a target than they had to when using earlier systems just to get a clear enough picture to launch a missile or take a shot. The report says the problem is bad enough that F-35 pilots may need to fly in so close to acquire the target that they would have to maneuver away to gain the distance needed for a guided weapon shot. Thus, the system’s limitations can force an attacking F-35 to compromise surprise, allowing the enemy to maneuver to a first-shot opportunity. Surrendering the element of surprise and enabling an opponent to shoot first is what we want to force the enemy to do, not ourselves. Another often-touted feature that is supposed to give the F-35 superior situational awareness is the Distributed Aperture System (DAS). The DAS is one of the primary sensors feeding the displays to the infamous $600,000 helmet system, and it is also failing to live up to the hype. The DAS sensors are six video cameras or “eyes” distributed around the fuselage of the F-35 that project onto the helmet visor the outside view in any direction the pilot wants to look, including downwards or to the rear. At the same time, the helmet visor displays the flight instruments and the target and threat symbols derived from the sensors and mission system. But because of problems with excessive false targets, unstable “jittered” images and information overload, pilots are turning off some of the sensor and computer inputs and relying instead on simplified displays or the more traditional instrument panel. Here again, the system is little better than those it’s supposed to replace. Test pilots also had difficulty with the helmet during some of the important Weapon Delivery Accuracy tests. Several of the pilots described the displays in the helmet as “operationally unusable and potentially unsafe” because of “symbol clutter” obscuring ground targets. While attempting to test fire short-range AIM-9X air-to-air missiles against targets, pilots reported that their view of the target was blocked by the symbols displayed on their helmet visors. Pilots also reported that the symbols were unstable while they were attempting to track targets. Then there is the matter of pilots actually seeing double due to “false tracks.” There is a problem with taking all of the information generated by the various onboard instruments and merging it into a coherent picture for the pilot, a process called sensor fusion. Pilots are reporting that the different instruments, like the plane’s radar and the EOTS, are detecting the same target but the computer compiling the information is displaying the single target as two. And as bad as the problem is in a single plane, it’s much worse when several planes are attempting to share data across the network. The F-35 has a Multifunction Advanced Data Link (MADL) that is designed to enable the plane to share information with other F-35s in order to give all the pilots a common picture of the battlespace. It does this by taking all of the data generated by each plane and combining it into a single, shared view of the world. But this system, too, is creating erroneous or split images of targets. Compounding the problem, the system is also sometimes dropping images of targets altogether, causing confusion inside the cockpits about what’s there or not there. F-35 boosters say it’s the network that matters — what actually matters is that the network isn’t working. The F-35 was intended to be a multi-role aircraft from its inception. This latest report provides a clear picture of how it stacks up so far in its various roles, including in comparison to each aircraft it’s supposed to replace. The news is not encouraging. The F-35’s shortcomings as an air-to-air fighter have already been well documented. It famously lost in mock aerial combat within visual range (WVR), where its radar stealth is of no advantage, to an F-16 in early 2015, one of the planes the F-35 is supposed to replace as an aerial fighter. The F-35 lost repeatedly in air-to-air maneuvering despite the fact that the test was rigged in its favor because the F-16 employed was the heavier two-seater version and was further loaded down with heavy, drag-inducing external fuel tanks to hinder its maneuverability. F-35 boosters argue that the plane’s low radar signature will keep it out of WVR situations, but the history of air combat is that WVR engagements cannot be avoided altogether. Missile failures, the effects of radar jamming and other hard-to-predict factors tend to force WVR engagements time and again. This latest report confirms the F-35 is not as maneuverable as legacy fighters. One such problem is known as wing drop, where the jet’s wingtip suddenly dips during a tight turn, something that can cause the aircraft to spin and potentially crash. Transonic speeds, just below the sound barrier, are the most critical spot of the flight envelope for a fighter plane. These are the speeds where, historically, the majority of aerial combat takes place. And it is at these speeds where the F-35 needs to be the most nimble to be an effective fighter. The program has attempted to fix the maneuverability performance problems by making changes to the F-35’s flight software rather than by redesigning the actual flight surfaces that are the cause of the problems. The software, called control laws, translates the pilot’s stick commands into behavior by the aircraft. One would expect that certain force by the pilot on the stick would result in an equivalent response by the plane. Because of the software changes, that’s sometimes not the case. For example, if a pilot makes a sharp stick move to turn the plane, the control law software now results in a gentler turn to prevent problems such as — and including — dig-in. F-35 apologists try to dismiss such issues by claiming that the F-35 was never intended for close-in aerial dogfighting, a claim belied by the Air Force’s insistence that the jet be equipped with a short range air-to-air gun. As an air-to-air fighter, the F-35’s combat capability is extremely limited because at the moment the software version only enables it to employ two missiles, and they have to be the radar-guided advanced medium-range air-to-air missiles (AMRAAMs); in the future it will carry no more than four if it wants to retain its stealth characteristic. 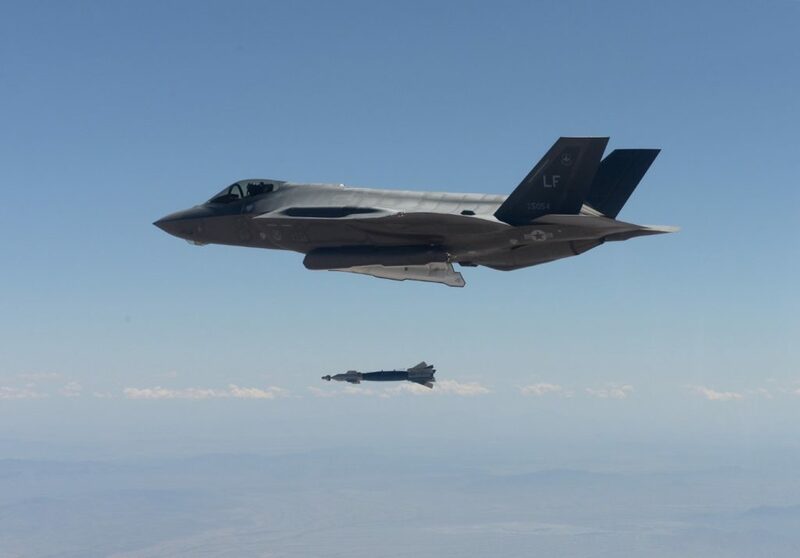 The F-35’s capability as an air-to-air fighter is currently further limited because the AMRAAM is not optimized for close, visual-range combat. Eventually, upgraded software versions will allow the plane to carry missiles other than AMRAAMs, but not any time soon. This means that any fight the F-35 gets into had better be short, because it will very quickly run out of ammunition. Its gun would be available in close-in fighting as well, but it’s not currently working because the software needed to effectively use it in combat hasn’t been completed. Engineers are working on yet more changes to the F-35’s control laws to correct for the door-induced error. Making these changes and performing the subsequent “regression” re-testing to confirm the effectiveness of the changes have delayed the actual gun accuracy tests. Until these tests occur, no one can know whether the F-35A’s cannon can actually hit a target. The F-35B and F-35C will both use an externally mounted gun pod rather than an internal version like the Air Force model. Because of differences in the shape of the fuselage of the two models, the Marine Corps and Navy will use different model gun pods. Both have been test-fired on the ground, but the flight tests to see what effect the pods have on the jet’s aerodynamics are only just now beginning. DOT&E has warned that, as happened with the gun door on the F-35A, unexpected flight control problems are likely to be discovered. The fixes to these will have to be devised and then tested as well. Only then will the program be able to begin the fuller in-flight accuracy testing, which is necessary to determine whether the gun pod is accurate. Developmental testing delays, and the process of fixing the problems that testing will likely uncover, are severe enough that the program may not have an effective gun for Initial Operational Test & Evaluation. This could not only further delay scheduled testing but also, more importantly, prevent the aircraft from reaching the warfighter any time soon. There are several major reasons F-35s will have extremely limited interdiction usefulness — the Air Force’s and Marine Corps’ declaration of “initial operational capability” notwithstanding. For instance, defense companies in Europe, Russia, China and even Iran have been hard at work for years developing and producing systems to defeat stealth aircraft. And they have had some success. We saw this clearly in 1999, when a Serbian missile unit shot down an F-117 stealth fighter with an obsolete Soviet-era SA-3 surface-to-air missile, a system first fielded in 1961. Serbian air defense crews discovered they could detect the stealth aircraft by using their missile battery’s longwave search radar. Then, using spotters and the missiles’ own guidance radars, the Serbian forces were able to track, target and kill one stealthy F-117. To show that was no fluke, the Serbian SAMs hit and damaged another F-117 so badly it never flew in the Kosovo Air War again. Unaffected by the special shapes and coatings of modern stealth aircraft, these search radars easily detect today’s stealth airplanes, including the F-35. Since WWII the Russians have never stopped building such radars and are now selling modern, highly mobile, truck-mounted digital longwave radars on the open market for prices as low as $10 million. The Chinese and the Iranians have followed suit by developing similar radar systems. An even simpler system that is even harder to counter than a long wavelength search radar is a passive detection system (PDS) that detects and tracks the radio frequency (RF) signals emitted by an aircraft — radar signals, UHF and VHF radio signals, identification-friend-or-foe (IFF) signals, data link signals like Link-16 and navigation transponder signals like TACAN. A good example of a modern PDS is the VERA-NG, a Czech system being sold internationally that uses three or more receiving antennas spaced well apart to detect and track and identify the RF signals emitted by fighters and bombers. The system’s central analysis module calculates the time difference of the signals reaching the receivers to identify, locate and track up to 200 aircraft transmitting radar signals. The VERA-NG is only one of many types of PDS used throughout the world — the Russians, Chinese and others produce PDSs as well, and these have been widely fielded for several years. The beauty of a PDS, from the perspective of an adversary employing one, is that radar stealth is irrelevant to it ability to detect and track aircraft. If the aircraft has to use its radar, radios, data links or navigation systems to accomplish its mission, the PDS stands a good chance of being able to detect, track and identify it by these emissions. Every aircraft in the world is susceptible to PDS, stealth and non-stealth alike, and the F-35 is no exception. The F-35’s main air-to-air weapon, the AIM-120, is a beyond visual range radar missile — as a result, the F-35 has to use a large radar transmitting high-power signals in order to detect airborne targets and then guide the missile to them. Likewise, the aircraft has to employ high-powered ground mapping radar signals to find ground targets at long range. Moreover, if the plane’s systems have to communicate with other aircraft in the formation or with off-board supporting aircraft like AWACS, it has to use its radios and data links. The F-35 is thus likely susceptible to detection by passive tracking systems. Several of these passive detection systems are significantly less expensive than search radars — and they are virtually undetectable electronically. The DOT&E report also lists several major reasons for the limited interdiction usefulness. One such reason is that the F-35’s Block 2B (USMC) and Block 3i (USAF) software prevents it from detecting many threats and targets while severely limiting the kinds of weapons it can carry. For example, the F-35 can currently only carry a few models of large guided direct attack bombs. None of these can be launched from a distance like a power guided missile. Rather they fall on a ballistic trajectory from the aircraft to the target, which means they can only be released at relatively short ranges in view of the target. The small number of weapon types the F-35 can carry also limits its flexibility in combat. The current software can only support one kind of bomb at a time, which DOT&E says is only useful when attacking one or two similar targets. So, for example, when a flight of F-35s departs loaded with bombs designed to destroy surface targets, they wouldn’t be able to also destroy any hardened or bunker targets because they wouldn’t have the heavier bombs required. The F-35 is projected to carry a larger variety of weapons as more software, bomb racks and testing to validate these are developed — but we will not know until 2021 which of those weapons are actually combat suitable. Moreover, in order to carry something other than two large guided bombs it will have to use external weapons and racks, significantly reducing the plane’s already disappointing range and maneuverability — and, of course, more or less eliminating stealth. The ability to penetrate heavily defended airspace to destroy fixed targets deep in enemy territory is an often-cited justification for the F-35. Of course, the F-35’s limited range — less than legacy F-16s — means that it is unlikely to be able to perform what the Air Force likes to call “deep strikes” well inside the homeland of large nations such as Russia and China. The 2016 DOT&E report describes some official foot-dragging that has delayed putting the F-35’s penetrating ability to the test. For instance, the program is only now starting to receive the critical ground radar simulator equipment, which mimic enemy radar systems, that are needed to conduct robust testing of the F-35’s effectiveness in highly contested, near-peer, scenarios. It’s only receiving that equipment because it was sought and procured by DOT&E when it became clear that the Services and the JSF Program Office were not going to pursue a test infrastructure adequate for replicating the near-peer threats the F-35 is expected to be able to counter. Deliveries of this equipment have begun but will not complete until early 2018. The JPO has not planned or budgeted for developmental flight-testing against it. The military does developmental and operational testing of stealth aircraft at the Western Test Range at Nellis Air Force Base in Nevada. The tests are conducted against the ground radar simulator equipment and surface-to-air missile launchers. Aircraft being tested fly over these arrays to see if the aircraft’s onboard sensors — in particular its electronic warfare systems and ground mapping radar — combined with offboard intelligence provided via data links can detect the threats and respond appropriately, such as by warning the pilots, jamming the signals or firing defense suppression missiles. The problem is a complicated one because the radar signals that reveal the presence of a SAM, for instance, thereby allowing the aircraft to either target the SAM or avoid it, are not necessarily distinctive and often closely resemble the signals of radars that pose no immediate threat to the aircraft. The F-35 can’t carry enough weapons to bomb everything. Its sensor and sensor fusion system must be able to tell the difference between enemy SAM radars that pose a genuine threat and the many innocuous radars that may be within range of detection — general purpose air surveillance radars, short-range, low-altitude air defense radars targeting weapons and not aircraft, and even nearby civilian air traffic control and weather radar systems. Equally crippling, until the ground radar simulator equipment is in place, the F-35 program will be unable to properly develop, validate and update the F-35’s mission-critical onboard software files, called Mission Data Loads (MDLs). MDLs are huge files specifying all target and threat locations together with their individual electronic and/or infrared signatures and all relevant mapping data. Without accurate, up-to-date MDLs, the F-35 cannot find targets or evade and counter threats — nor can it carry out the networking and sensor fusion functions that are said to be its primary strengths. The F-35 cannot go to war without its MDLs. 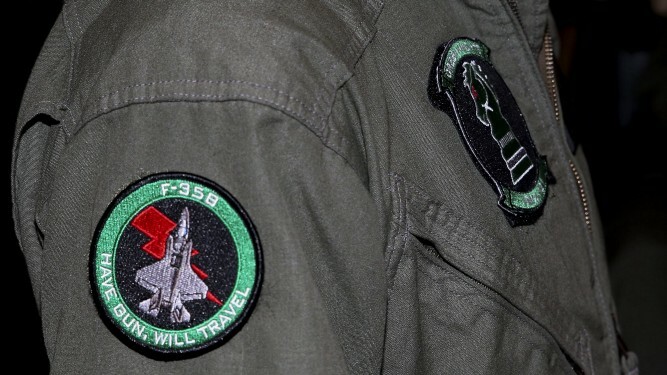 The MDLs also need to be updated continuously with information concerning such things as threats, targets and signals that is gathered on every F-35 mission. 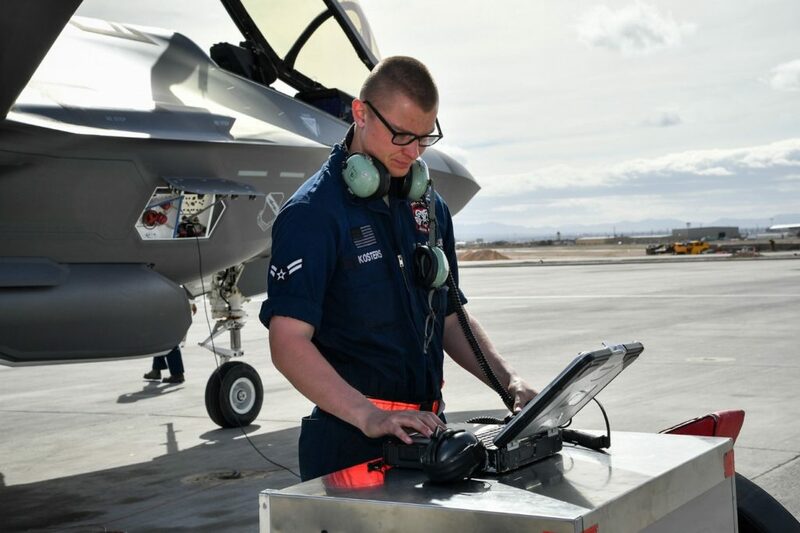 F-35 pilots can only be sure the MDLs they need to survive work properly after they have been tested over ranges equipped with the necessary ground radar simulator equipment. New and complete MDLs must be created for each theater or conflict zone by a central reprogramming lab using massive data inputs from the relevant combat command. F-35s operating out of England would have different files from F-35s based in Japan, for example. Only one such reprogramming lab exists today and, due to JPO mismanagement, it is has only recently been scheduled to receive necessary upgrades to produce a validated MDL. It takes the lab 15 months to produce a complete MDL. If F-35s are suddenly needed in a new, unanticipated theater of operation, those F-35s will not be able to fly combat missions for at least 15 months. Because the full range of necessary ground radar simulator equipment for the reprogramming lab is not yet in place, DOT&E stated that the earliest the reprogramming lab will be able to produce validated MDLs just for IOT&E will be June 2018. The F-35 has plenty of shortfalls performing air-to-ground interdiction missions well away from the immediate battlefield, but it is even worse in its other intended air-to-ground role directly in support of engaged troops, close air support (CAS). DOT&E concluded that the F-35 in its current configuration “does not yet demonstrate CAS capabilities equivalent to those of fourth generation aircraft.” This statement is particularly disturbing in light of the Air Force chief’s recent statements that the service intends to renew its efforts to cancel the CAS-combat-proven A-10 in 2021. CAS is the other major mission where a lack of an effective cannon will significantly limit the F-35’s combat usefulness. An effective cannon is essential for many CAS missions where any size bomb, guided or unguided, would pose a danger to friendly troops on the ground or where there are concerns about collateral damage, such as in urban environments. The cannon is even more crucial when our troops are being ambushed or overrun by enemies only meters away, in “danger close” situations where only pinpoint effects delivered by the most highly accurate fire can help our side and kill or disperse the enemy. Ground commanders interviewed as part of a recent RAND study said they preferred the A-10’s cannon fire even to guided munitions because 80 percent of the cannon rounds fired hit within a 20-foot radius of the aiming point, providing exactly the kind of precision that danger close situations absolutely require. Cannons are also most useful for hitting moving targets because a cannon burst can lead the target in anticipation of movement. None of the three F-35 models in the current fleet can use cannons in combat. In fact, none of them are even close to completing their developmental flight tests — much less their operational suitability tests — for airframe safety, accuracy and target lethality. Even worse, based on preliminary test experience, it appears that the severe inaccuracy of the helmet-mounted gunsight on all three F-35 versions that makes the cannon ineffective in air-to-air combat will also make it ineffective in CAS — and that the helmet’s accuracy problem may be technically inherent and incurable. Note that the cannon accuracy requirements for CAS are considerably more stringent than for air combat: when shooting in close proximity to friendly troops, even minor accuracy problems can have tragic consequences. As mentioned before, the gun pods for the Marines’ F-35B and the Navy’s F-35C will likely add another source of inaccuracy — also possibly incurable — and remain untested for CAS. The combat suitability of F-35 cannons for CAS will not be known until the end of Block 3F IOT&E, which is unlikely before 2021. Failure to complete these CAS tests realistically — a distinct possibility given JPO mismanagement and delaying of test resources — will certainly jeopardize the lives of American troops. Even when the symbols being displayed by the helmet do not obscure the pilot’s ability to see the target, the F-35’s canopy might. The jet’s canopy is a thick acrylic material with a low observable coating to preserve stealth. This makes the canopy less transparent and according to the DOT&E appears to be distorting the pilot’s view. Further limiting the cannon’s effectiveness in each version of the F-35 is the number of 25-millimeter rounds it carries — 182 for the F-35A and 220 for the B and C. This is grossly deficient for CAS, especially when compared to the over 1,100 30-millimeter shells carried by the A-10. While the A-10 has enough cannon rounds for between 10 and 20 attack passes, any variant of the F-35 will only have enough for two, maybe four, passes. Even more limiting in the effective use of any CAS weapon, cannon or other, is the F-35’s inability to fly low and slow enough to find typical hard-to-see CAS targets and safely identify them as enemy or friendly, even when cued by ground or air observers. Due to its small, overloaded wings, the F-35 cannot maneuver adequately at the slow speeds that searching for concealed and camouflaged targets requires — and being completely unarmored and highly flammable, it would suffer catastrophic losses from just the small rifle and light machine gun hits inevitable at the low altitudes and slow speeds required. In sharp contrast, the A-10 was specifically designed for excellent low and slow maneuverability and, by design, has unprecedented survivability against those guns, and even against shoulder-fired missiles. Air Force officials have often argued that the lack of an effective gun or inability to maneuver low and slow won’t matter in future wars because the Air Force intends to conduct CAS differently — that is, at high altitudes using smaller precision munitions. But the F-35 will not be cleared to carry those weapons for at least five years. In the meantime, the F-35 can carry only two guided bombs right now, and those are 500 pounds or larger. None of those models are usable in proximity to friendly troops. According to the military’s risk-estimate table, at 250 meters (820 feet), a 500-pound bomb has a 10 percent chance of incapacitating friendly troops. This means that within that bubble, the enemy can maneuver free from close air support fires. A 250-pound Small Diameter Bomb II is now in low rate production and cleared for use on the F-15E; even that, though, is much too large to be used near friendly troops in “danger close” firefights, and the software and bomb racks necessary to employ it on the F-35 will not be available and cleared for combat until 2021 at the earliest. Close air support is more than aircraft simply dropping bombs on targets. To be truly effective, CAS missions require detailed tactical coordination between the pilots and the troops fighting on the ground. For decades, this has been done effectively through radio communication, and in recent years, operational aircraft have been upgraded with digital communication links for voice and data over networked systems called Variable Message Format and Link-16. In flight tests, the F-35’s digital data links have experienced significant difficulties, including dropped messages or information being transmitted in the wrong format. This has forced pilots and ground controllers to work around the system by repeating the information by voice over the radio. In a close firefight, when seconds count, this is a dangerous delay the troops can ill-afford. F-35 defenders are always quick to point to the allegedly lethal capabilities of near-peer adversary air defense systems as justification for the necessity of using F-35s in CAS as well as in interdiction bombing. Introducing a sounder tactical and historical perspective, Air Force Col. Mike Pietrucha points out that the scenario of flying CAS missions over an area of heavy air defense threats is unlikely at best. The cumbersome, slow-moving, and logistics-intensive “high threat” missile systems are unlikely to be dragged along by a near-peer enemy conducting modern mobile warfare. Our close support pilots are much more likely to face lesser light and mobile air defenses (machine guns, light anti-aircraft guns, and man-carried heat-seeking missiles) just as they faced during World War II, Korea, Vietnam, Desert Storm and the wars of the past 15-plus years. In announcing F-35 IOC, the Marines — who used to prize CAS as part of the unique Marine heritage — and the Air Force apparently deem these F-35 CAS limitations acceptable. But it is shameful to see close air support treated as an afterthought tacked on to the F-35 program. To provide adequate CAS, the taxpayers’ money would be far better spent maintaining the battle-proven A-10 until a significantly more effective and even more affordable follow-on is tested and fielded. One of the most important characteristics the Navy’s variant of the F-35 must have is that it has to be able to operate from aircraft carriers. Otherwise, what is the point of designing a specialized naval version of the plane? But the Navy’s own pilots say the F-35C doesn’t work with the ships. 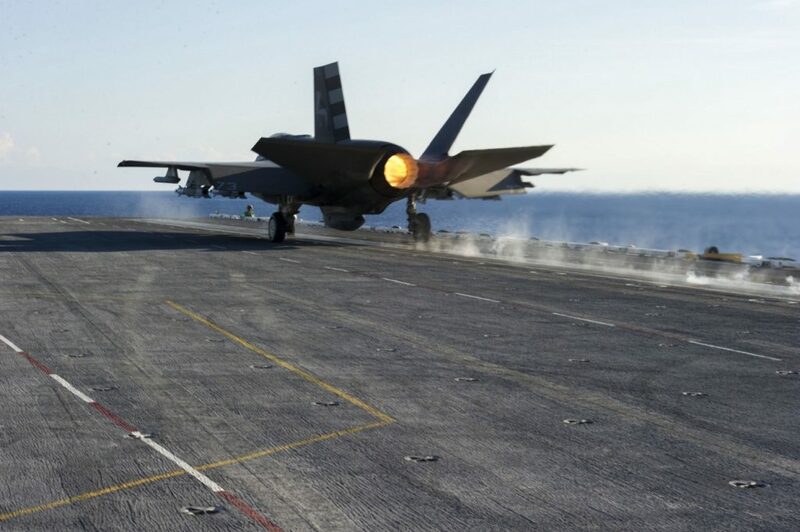 Aircraft taking off from the confined decks of carriers require a major boost to reach the necessary speed to achieve lift and takeoff, which is accomplished with a catapult set into the flight deck. Before the jets are launched, the pilots increase the engine thrust. To keep the jets from rolling off the front of the ship before launch, they are held down with hold-back bars. The force of the thrust compresses the gear’s strut as it is being held down. When the hold-back bar is released and the jet is launched, the F-35C’s strut is unloaded, causing the nose to bounce up and down, jarring the pilot according to a Navy report that was leaked to Inside Defense in January 2017. The severity of this can be clearly seen here. The problem is dangerous to the pilot. The Helmet-Mounted Display is unusually heavy, currently weighing in at 5.1 pounds, and when that’s combined with the forces generated during a catapult launch, the extra weight slams the pilot’s head back and forth. In 70 percent of F-35 catapult launches, pilots report moderate to severe pain in their heads and necks. The launch also impacts the alignment of the helmet. Pilots reported difficulty reading critical information inside the helmet, and they have to readjust it after getting into the air. The pilots say this is unsafe as it happens during one of the most critical phases of any flight. Pilots try to counter the oscillations by cinching down their body harnesses tighter, but this creates a new problem by making it hard to reach emergency switches and the ejection handles in the event of an emergency. The F-35’s Program Manager, Lt. Gen. Christopher Bogdan, has said he will attempt a short-term tweak to the F-35C’s nose gear strut to fix the problem, but a longer-term fix may actually be required, such as a redesign of the entire front landing gear assembly. This is unlikely to begin until 2019 — the same year the Navy has said it intends to declare the F-35C ready for combat. By that time, the Navy will likely have 36 F-35Cs in the fleet, each of which would then need to have the front landing gear replaced, at a yet-to-be determined cost. The F-35C’s problems aren’t limited to the beginning of a flight. Just as a jet needs help taking off from a carrier, it also needs help stopping during the landing. This is accomplished by cables strung across the deck. When a jet comes in for a landing, a hook on the aircraft catches one of the cables, which uses a hydraulic engine inside the ship to absorb the energy and bring the jet to a halt. The test teams have found that the hook point on the F-35C’s arresting gear is wearing out three times faster than it is supposed to. Though it is supposed to last a minimum of 15 landings, the longest a hook point has lasted in testing is five. The program is reportedly considering redesigning the arresting gear to be more robust. Another structural issue yet to be resolved on the F-35C involves the wings. During test flights, engineers discovered the ends of the wings were not strong enough to support the weight of the AIM-9X short-range air-to-air missile. The F-35C’s wings fold at the ends to save space in the crowded confines of the deck and hangars on aircraft carriers. When the missiles are carried past the wing fold, the weight exceeds structural limits when the plane maneuvers hard and during landings. According to DOT&E, until the problem is corrected, “the F-35C will have a restricted flight envelope for missile carriage and employment, which will be detrimental to maneuvering, [and] close-in engagements.” It’s more detrimental, even, than the F-35’s other inherent maneuvering limitations. The problem is bad enough that Lt. Gen. Bogdan has admitted the F-35C will need an entirely redesigned outer wing. Launching and recovering planes is only one part of the challenge for naval aviation. Maintenance crews also have to be able to keep the jets flightworthy while at sea. One of the critical maintenance functions that crews have to be able to perform is an engine removal and installation (R&I). Crews performed the first R&I proof-of-concept demonstration aboard the USS George Washington in August 2016. It took the crew 55 hours to complete the engine swap, far longer than it takes to perform the same action on a legacy aircraft. The engine on an F/A-18, for instance, can be replaced in six to eight hours. DOT&E noted the crew took its time performing all the necessary steps for safety purposes, and pointed out that future iterations would likely be a little faster as the crews gain more experience. That said, the crew had full use of the entire hangar bay space, something they wouldn’t have with an air wing embarked on the ship. This likely sped up the process during this demonstration. Replacing the engine in the F-35 is more complicated than in an F/A-18. Crews must remove several more skin panels and a large structural piece called the tail hook trestle in order to remove the engine, thus requiring more space in the maintenance hangar. These parts and all the tubes and wires associated with them must be stored properly to prevent damage, also taking extra space. The maintenance crews must perform this process with a full air wing present in order to know whether the system is operationally suitable. And the process must become significantly more efficient to generate the sortie rate needed for combat. Another problem uncovered during the trials on the George Washington involved the transmission of the massive data files the F-35C’s computers produce. The F-35 program relies on the Autonomic Logistics Information System (ALIS), the enormous and complex computer system all F-35s use for mission planning, maintenance diagnosis, maintenance scheduling, parts ordering and more. To work properly, the system has to move large volumes of data across the network on and off the ship. During the Washington trials, the crew had to transmit a moderately sized 200 MB ALIS file over the ship’s satellite network. It took two days. Bandwidth limitations and spotty connectivity had drastically impeded the transmission of the data. Many such transmissions — and even larger ones — will be required to support an entire air wing. 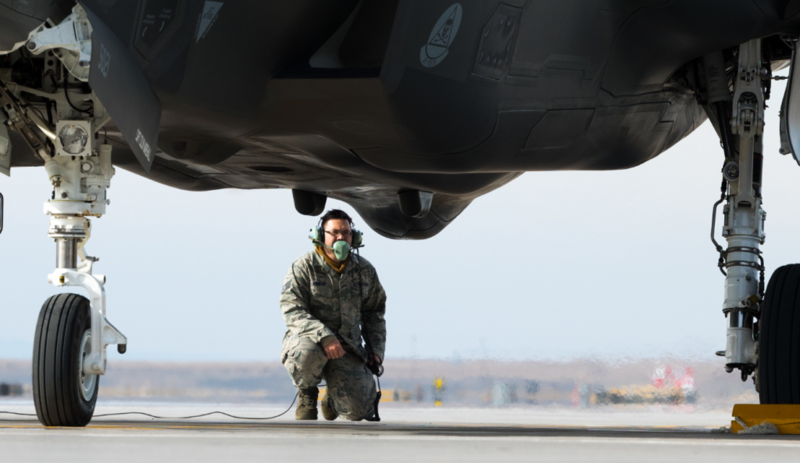 Additionally, the fleet often operates in periods of “emissions control,” or radio silence, to avoid giving away its position to the enemy, further bottlenecking the transfer of the data necessary to keep the F-35s flying. The George Washington trials generated plenty of fawning press coverage. And publicly at least, the Navy claimed success. However, there is evidence that the Navy is not too excited with the program because of the kind of problems discussed above and, of course, the cost — the service has been slow to purchase the F-35Cs. While the Air Force is set to buy 44 new F-35s in 2017, the Navy will only buy two. The Navy also requested 14 additional F/A-18s in its 2017 Unfunded Priorities (“Wish”) List and only two more F-35Cs. Moreover, this is the only variant the services have not rushed to prematurely declare combat ready. Some Pentagon leaders have said the Navy variant is the only one threatened by a review that was ordered by the Trump administration and that Secretary of Defense James Mattis is currently conducting. This may prove to be one part of the program where a viable alternative to the F-35 is sought. Much has been said since the election about further F-35 purchases and affordability. President Donald Trump questioned the program’s value in a series of tweets before the inauguration, but hopes that the program would be dramatically altered were dashed when he declared he had convinced Lockheed Martin to shave $600 million from the price of the latest batch of F-35s. Lockheed Martin and their partners within the JPO had already stated the price would be lower, largely due to improved efficiencies in manufacturing. On the surface, this seems like a great development for the American taxpayers, but any money “saved” now will end up costing far more in the future because we are buying a bunch of untested prototypes that will require extensive and expensive retrofits later. And this problem will only be compounded if Lockheed Martin and the Joint Program Office get their way and Congress approves a three year “block buy” of 400 F-35s before the program completes the testing and evaluation process. The prices quoted in the press are usually based on the cost of an Air Force conventional take-off variant, the F-35A — the least expensive of the three variants. In addition, that cost figure is only an estimate of future costs, one that assumes everything will proceed perfectly for the F-35 from here on out — which is unlikely as the program enters its most technologically challenging test phase. As this latest DOT&E report shows, the program has a long way to go before the F-35 will be ready for combat. The Joint Program Office recently claimed that the price for an F-35A went below $100 million each in the FY 2016 contract. Yet in its FY 2016 legislation, Congress appropriated $119.6 million per F-35A. Even this amount doesn’t tell the whole story — it only covers the procurement cost, not what it will cost to bring F-35As up to the latest approved configuration, nor the additional Military Construction costs to house and operate F-35As. And of course, the $119.6 million price tag does not include any of the research and development costs to develop and test the F-35A. The 2016 production-only cost for the Marine Corps’ F-35B and the Navy’s F-35C is $166.4 million and $185.2 million per plane, respectively. First, they don’t include how much it will cost to fix design flaws discovered in recent, current and future testing — a not insubstantial amount of money. 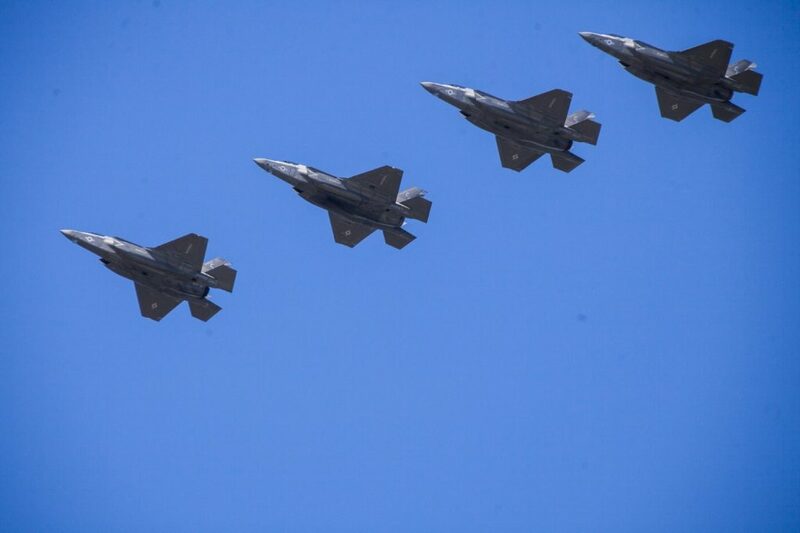 Nor do they include the costs of planned modernization efforts, such as for Block 4 of the aircraft, which will be incorporated into all F-35As in the future. The Government Accountability Office estimates the program will spend at least $3 billion on the modernization effort in the next six years. For example, modifications to fix just some of the problems identified up to now cost $426.7 million, according to the GAO. Each of these aircraft were already modified and they will require more in the future. The Air Force has already acknowledged it must retrofit all 108 of the F-35As delivered to it and in the operational fleet. These costs will continue to grow as known problems are fixed and new ones are discovered, and they are an integral part of the cost per airplane. As the program moves out of the easy part of the testing — the development or laboratory testing — and into the critical combat (operational) testing period in the next few years, even more problems will be uncovered. A good example occurred in late 2016 when engineers discovered debris inside the fuel tank of an F-35. Upon closer inspection, they found that the insulation wrapped around coolant lines had disintegrated because a subcontractor failed to use the proper sealant. And, when the GAO estimated it would cost $426.7 million to fix some of the known problems in the F-35As already in depot, the coolant line insulation problem had not been discovered. Fixes to this and other problems will all have to be devised, tested and implemented throughout the fleet of aircraft already produced and purchased. Second, the incomplete unit cost estimates used by the JPO, Lockheed Martin and the Pentagon in general — their so called “flyaway” unit costs — do not include the purchase of support equipment (tools, computers for ALIS, simulators for training, initial spare parts, and more) needed to enable the F-35A fleet to operate. Quite literally, the DoD’s “flyaway” cost does not buy a system capable of flight operations. The 798 jets the services would have at the end of the block buy of about 450 from 2018 to 2021 would be nearly 33 percent of the total procurement … all before the program completes initial operational testing and has discovered what works as intended and what doesn’t. 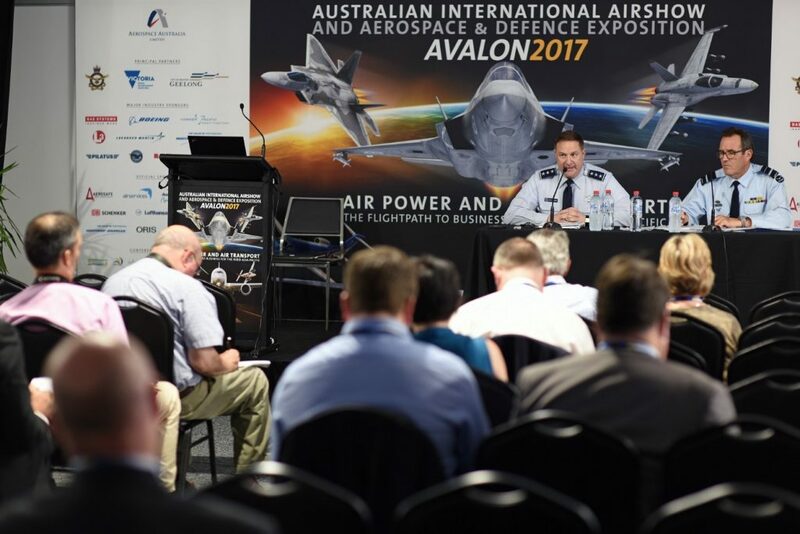 It is important to note that the real problem-discovery process will only begin when operational testing starts in 2019, as scheduled, or more likely in 2020 or 2021 when operational representative aircraft are actually ready to be tested. The 108 aircraft the Air Force has begun to modify are only the tip of the iceberg, and that number does not include the hundreds of Marine Corps and Navy aircraft to be similarly modified. Would the Block Buy be consistent with the “fly before you buy” approach to acquisition advocated by the administration, as well as with the rationale for the operational testing requirements specified in title 10, U.S. Code, or would it be considered a “full rate” decision before IOT&E is completed and reported to Congress, not consistent with the law? Federal law allows multiple-year contracts to purchase government property so long as certain criteria have been met. Congress typically authorizes most weapons buying programs on a year-by-year basis to ensure proper oversight of the program and to maintain incentives for the contractor to satisfactorily perform. According to Title 10 U.S.C., Section 2306b, for a program to be eligible for multiyear procurement, the contract must promote national security, should result in substantial savings, have little chance of being reduced, and have a stable design. The F-35 seems to be failing at least two of the first three criteria and is most certainly failing the fourth. An essential part of the question about F-35 costs is whether it makes sense to buy a large block of aircraft and worry about the costs to fix their yet-to-be-discovered problems later. It is certainly a good way to add to the cost but hide it in the interim. And there still remains the cost of actually operating the F-35 fleet. DoD has estimated that all training and operational operations over the 50-year life of the program — assuming a 30-year life for each aircraft — will be $1 trillion, making the cost to buy and operate the F-35 at least $1.4 trillion. The cost just to operate the F-35 is so high because the aircraft is so complex compared to other aircraft. Based on the Air Force’s own numbers, in FY 2016 each F-35 flew an average of 163 hours at $44,026 per flying hour. For comparison purposes, in the same year, each F-16 in the fleet flew an average of 258 hours at $20,398 per flying hour. A-10s flew 358 hours on average at $17,227 per hour. While these hours have never been independently audited, and it is it is impossible to know if they are complete, the available data indicates that the F-35 is more than twice as expensive to fly as the aircraft it is to replace. One of the more significant ways the Pentagon is hiding the true costs of the F-35 is that it has put off until Block 4 the development and delivery of many key capabilities that should have been delivered in Block 3. 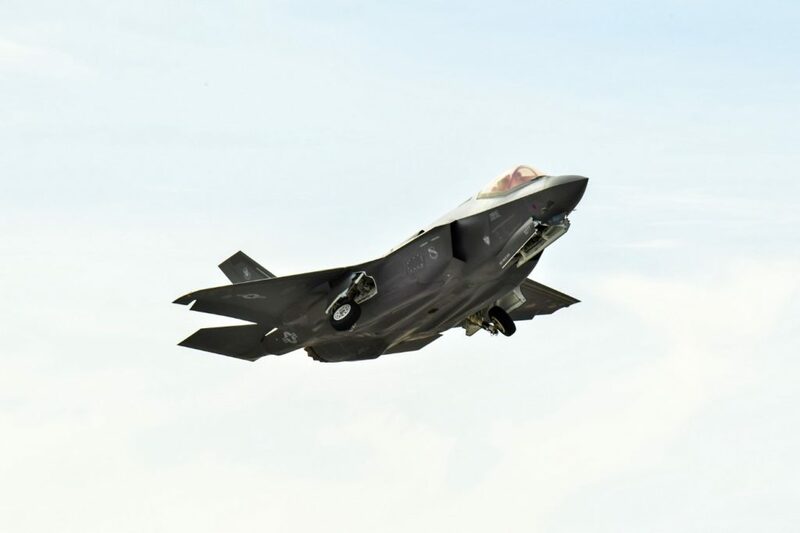 Currently planned, but not included in the official cost estimate of the F-35 — or even as a complete separate acquisition program — is a four-part Block 4 upgrade costing at least $3 billion, according to the Government Accountability Office. That means there are 17 key combat capabilities the F-35 program can’t yet deliver and that the program office is attempting to give Lockheed Martin a pass on delivery until the later in the advanced development process. Although no one has publicly stated which 17 combat capabilities won’t be included now, they were all functions the F-35 was supposed to have, and for which the American people are paying full price. So we will be paying more money in the future to upgrade F-35s purchased now so they can perform the functions we already paid for. The $119.6 million unit cost for the F-35A in 2016 is a gross underestimate, and the additional costs will not be fully known for years. Those who pretend the cost in 2016 is somewhere below $100 million each are simply deceiving the public. In every first-rate air force, turning out superior fighter pilots requires them to fly at least 30 hours a month to hone and improve their combat skills. Here lies the single largest cause of the F-35’s lack of combat effectiveness: because of the plane’s unprecedented complexity and the corresponding reliability and maintenance burdens, pilots simply cannot fly them often enough to get enough real flying hours to develop the combat skills they need. Pilot skills atrophy if the pilots can’t get enough flight hours. Even with superior technology, less skilled pilots could be outmatched in the sky by highly trained pilots flying less sophisticated aircraft. Inadequate flight time also creates a dangerous safety situation that threatens pilots’ lives in training. The Marine Corps suffered nine serious aircraft crashes in the past year, with 14 people killed. The Corps’ top aviator recently said the spike in crashes is mainly due to pilots not having enough flying hours. This trend will worsen with the F-35. Given its inherent complexity and the associated cost, it is highly unlikely the F-35 will ever be able to fly often enough to turn out winning pilots. Can the F-35 be where it’s needed, when It’s needed? Even if, and this is a big IF, the F-35 could perform in combat the way Lockheed Martin says it can — to say nothing of how a competent replacement for the F-16, A-10 and F-18 should perform — the program is still next to worthless if the jets can’t be where they need to be when they are needed. Several factors contribute to the difficulty in deploying an F-35 squadron in a timely fashion. One is the F-35’s mission planning system, a part of the ALIS network. After the details of a combat mission — such as targets, predicted enemy radar locations, the routes to be flown and weapon load — are worked out, the data needs to be programed into the aircraft. This information is loaded onto cartridges which are then plugged into the jet. F-35 pilots program these cartridges on the Offboard Mission Support (OMS) system. The problem, DOT&E found, was that pilots consistently rated the system used to support mission planning “cumbersome, unusable, and inadequate for operational use.” They report that the time it takes to build the mission plan files is so long that it disrupts the planning cycle for missions with more than just one aircraft. This means that when several F-35s receive a mission, they can’t go through all the pre-flight processes fast enough to launch on time if anything but a huge amount of planning time is allotted. The Air Force conducted a major test of the F-35 program when it conducted a deployment demonstration from Edwards Air Force Base in California to Mountain Home Air Force Base in Idaho in February and March 2016. 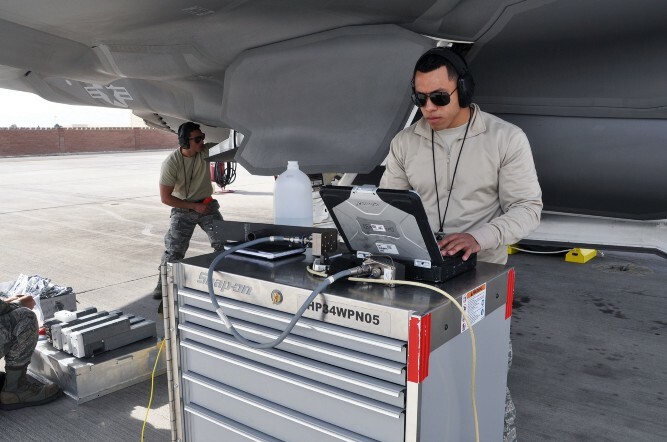 This was the service’s first attempt to use an updated version of the ALIS — the ground-based computer system that is supposed to diagnose mechanical problems, order and track replacement parts, and guide maintenance crews through repairs. Whenever a squadron deploys, it must establish an ALIS hub wherever the F-35 is deployed. Crews set up an ALIS Standard Operating Unit (SOU), which consists of several cases of computer equipment. Technicians will use these to set up a small mainframe which must then be plugged into the world-wide ALIS network. The ALIS data must go wherever a squadron goes. Crews must transfer the data from the squadron’s main ALIS computers at the home station to the deployed ALIS SOU before the aircraft are permitted to fly missions. This process took three days during the Mountain Home deployment. This was faster than in earlier demonstrations, but Lockheed Martin provided eight extra ALIS administrators for the exercise. It is unclear if the contractor or the Air Force will include this level of support in future deployments. When the squadron redeployed back to Edwards at the end of the exercise, it took administrators four days to transfer all the data back to the main ALIS computer. Delays of this kind will limit the F-35’s ability to rapidly deploy in times of crisis. Even if the jets can be positioned in enough time to respond to a crisis, problems like lengthy uploading times could keep them on the ground when they are needed in the sky. An aircraft immobilized on the ground is a target, not an asset. Another time-consuming process involves adding new aircraft to each ALIS standard operating unit. Every time an F-35 is moved from one base to another where ALIS is already up, it must be inducted into that system. It takes 24 hours. Thus, when an F-35 deploys to a new base, an entire day is lost as the data is processed. And only one plane at a time can upload. If an entire squadron, typically 12 aircraft, needed to be inducted, the entire process would take nearly two weeks, forcing a commander to slowly roll out his F-35 aircraft into combat. There have also been delays with the program’s critical mission software. As mentioned before, the F-35 requires expansive mission data loads (MDLs) for the aircraft’s sensors and mission systems to function properly. MDLs, in part, include information about enemy and friendly radar systems. They send the search parameters for the jet’s sensors to allow them to properly identify threats. These need to be updated to include the latest information. They are also specific for each major geographic region. Officials identified critical deficiencies with management of this lab in 2012. Taxpayers spent $45 million between 2013 and 2016 to address these concerns. Despite the warnings and the extra funds, development of the lab continues to be plagued with mismanagement that prevents “efficient creating, testing, and optimization of the MDLs for operational aircraft” in the current basic combat configurations. The lab needs to be upgraded to support each software version being used on the F-35. The lab is currently configured to support the block 2B and 3i software versions. The first full combat capable software version for the F-35 will be Block 3F. The lab requires significant changes to support this version, which will be necessary for combat testing and, more importantly, full combat readiness. The lab is so far behind that some of the necessary equipment hasn’t even been purchased yet. For example, this facility is also dependent on the specialized radio frequency generators mentioned earlier to re-create the kind of signals a potential adversary might use against the F-35. The lab will use these to test the MDLs before they are sent out to be loaded on the fleet aircraft to ensure the jet’s sensors will identify them properly. In the rush to a pretend initial operational capability, the Air Force and the Marines have actually created an aircraft completely unready to face the enemy. Even if an F-35 squadron can get to where it is needed, when it is needed, what good is it if it can’t then fly on missions? This is one of the most enduring problems of the F-35 program. The fleet has had a notoriously poor reliability track record — it failed to achieve many of its interim reliability goals, and continued to do so through 2016. As the program creeps towards the all-important operational test phase, there are real concerns the aircraft will not be able to fly often enough to meet the testing schedule. There are also concerns about how often the jets will be able to fly when called up for combat service. “Availability” measures how often aircraft are on hand to perform at least one assigned mission. The services strive to maintain an 80 percent availability rate for their aircraft for sustained combat operations, as most aircraft achieved, for example, in Operation Desert Storm in the Persian Gulf in 1991. This is the same rate the testing fleet needs in order to meet the IOT&E schedules. So far, the F-35 program has not even been able to meet its interim goal of 60 percent availability. The fleet averaged a 52 percent availability rate for FY 2016. This is an improvement over recent years, but DOT&E cautions “the growth was neither steady nor continuous.” And the growth curve is behind schedule. The aircraft that will be used for operational testing need to be kitted out with specialized instruments to measure performance. There are currently 17 of these jets stationed at California’s Edwards Air Force Base. The average availability rate of this test fleet was 48 percent in the first nine months of 2016. There are several factors dragging down the availability rate for the F-35 fleet. Many of the aircraft have had to be sent back to the depots for major overhauls, a consequence of the program’s high concurrency level. 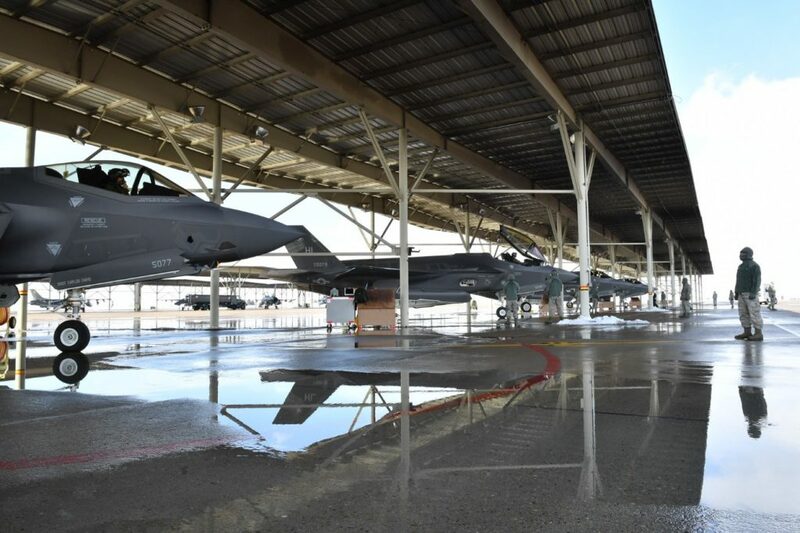 For instance, 15 F-35As needed to be sent back to correct the manufacturing defect where the foam insulation inside the jet’s fuel tanks deteriorated casting debris into the fuel. Even when the aircraft aren’t away for major overhauls, they aren’t flying very much. Of the aircraft that are available, they can be broken down into two categories: the Mission Capable and Fully Mission Capable. Mission Capable aircraft are those that are ready to conduct at least one type of mission, even if it’s only a training mission; Fully Mission Capable aircraft are those ready to conduct all missions the aircraft is declared to be capable of. The latter is the real measure of a combat-ready aircraft. The availability rates of both the Mission Capable and Fully Mission Capable F-35s went down in the last year. The Mission Capable rate for the fleet was 62 percent in FY 2016, down from 65 percent in FY 2015 [DG3]. The Fully Mission Capable rate was only 29 percent, compared to 46 percent the year before. The Gilmore report cites failures of major combat systems like the Distributed Aperture System, Electronic Warfare System, Electro-Optical Targeting System, and the radar as the highest drivers of the drop in capability rates. Significantly, the systems said to give the F-35 its unique combat capabilities are the very systems that keep the F-35 on the ground — demonstrating no capability whatsoever. On average, the Air Force’s F-35s could only fly two sorties a week in 2016 according to the recently released annual operational cost chart. By comparison, the F-16 averaged nearly three sorties per week and the A-10 fleet averaged nearly four. And the F-35 requires a great deal of maintenance to achieve even that. While there have been public statements in official releases saying how easy it is for maintenance personnel to work on the jets, the DOT&E report paints a different picture. Problems with the supply chain are already forcing maintainers to cannibalize planes; taking parts from one plane to install on another in order to ensure at least one will fly. Cannibalization has the effect of increasing the total time to make the repairs, as it adds the extra step of stripping the part from the donor jet rather than just taking a new or repaired part out of the box. It also requires the part to be installed twice: first in the repaired jet and then in the cannibalized jet. For FY 2016, maintainers had to cannibalize parts for nearly one in 10 sorties flown, which is short of the program’s unimpressive goal of no more than eight cannibalization actions in every 100 sorties. The problems with supplies are likely to lessen as production increases, but fundamental design issues will endure. A prime example is the unique maintenance requirements inherent to the F-35’s stealth coatings. It takes much longer to make some repairs to stealth aircraft because it takes time to remove low-observable materials, fix what is broken and then repair the stealth skin. These repairs often involve using adhesives that require time to chemically cure. Some of these materials can take as long as 168 hours — a full week — to completely dry. When Lockheed Martin first won the contract 17 years ago, the F-35 was expected to begin operational testing in 2008. Once they failed to meet that, 2017 was supposed to be the big year for the start of the combat testing process. We now know that this process will almost certainly be delayed until 2019 … and possibly 2020. The first page of the DOT&E report lists 13 major unresolved problems with the F-35 that will prevent the program from proceeding to combat testing in August 2017. But you wouldn’t know any of that from the public comments made by officials in charge of the program. During testimony before a House Armed Services subcommittee in February, officials neglected to raise any of these issues with Congress even though the DOT&E report had been released less than a month earlier. The scale of the challenge yet remaining with the F-35 is easily quantified in this year’s DOT&E analysis. According to the report, the F-35 still has 276 “Critical to Correct” deficiencies — these must be fixed before the development process ends because they could “lead to operational mission failures during IOT&E or combat.” Of the 276, 72 were listed as “priority 1,” which are service-critical flaws that would prevent the services from fielding the jets until they are fixed. Much has already been made about the F-35’s shortcomings in combat, yet structural problems still remain with the basic airframe. An example of this is a failure of an attachment joint between the jet’s vertical tail and the airframe. This has been a persistent problem, as the shortcoming was discovered in the original design. Engineers discovered premature wear in a bushing used to reinforce the joint during early structural tests in 2010. The joint was redesigned and incorporated in new aircraft in 2014. In September 2016, inspectors discovered the redesigned joint had failed after only 250 hours of flight testing — far short of the 8,000 lifetime hours specified in the JSF contract. These are used to determine whether the system is meeting the contract specifications. Testing teams also add non-baseline test points for various reasons to fully evaluate the entire system. Examples include adding test points to prepare for the later, more complicated tests, to re-test the system after software updates to make sure the new software didn’t alter earlier results, or “discovery test points,” which are added to identify the root cause of a problem found during other testing. The program budgeted for 3,578 test points for the F-35’s mission systems for 2016. The test teams weren’t able to accomplish them all, finishing 3,041 while also adding 250 non-budgeted test points through the year. Despite the slipping schedule, the F-35 program office has expressed a desire to skip many needed test points and to instead rely on testing data from previous flights — where the test aircraft used earlier software versions — as proof the upgraded system software works. But DOT&E warns that the newer software versions likely perform differently, rendering the earlier results moot. Program managers essentially want to declare the developmental testing process over and move on to operational testing, even though they haven’t finished all the necessary steps. The program office appears to be dragging its feet with regards to testing many of the capabilities that supposedly make the F-35 so indispensable. That is, it was meant to test in virtual reality those complex and rigorous scenarios that are impossible or too dangerous to test in real life, short of actual war. The contractors fell so far behind construction schedule that the JPO abandoned VSim in 2015. Instead, Naval Air Systems Command was tasked with building a government-run Joint Simulation Environment (JSE) to perform VSim’s mission. The contractors are supposed to provide aircraft and sensor models, but so far “negotiations for the F-35 models have not yet been successful.” This is preventing the program from designing the virtual world where the F-35 and enemy aircraft and defenses interact as they would in the real world, causing further delays. The F-35 cannot be fully tested without a properly prepared JSE. The simulation has to be designed based on real-world data gathered during flight tests or the simulation would only test what the contractor says the jet can do. The program is also formulating plans to reduce the number of testing personnel and test aircraft just when the program needs them the most. These plans would see the number of test aircraft cut in half from 18 to nine and testing workforce reduced from 1,768 to 600. Gilmore reported shortly after the Air Force IOC declaration that the program will not be able to produce enough F-35s in the necessary final configuration to proceed with operational testing. “Due to the lengthy program delays and discoveries during developmental testing, extensive modifications are required to bring the OT aircraft, which were wired during assembly to accommodate flight test instrumentation, into the production representative configuration required,” the report states. It goes on to say that more than 155 modifications have to made to the 23 planes specifically tasked for the upcoming combat (“operational”) testing and that some of these have not even been contracted yet, meaning that the start of IOT&E will be further delayed. Not only has the Joint Program Office failed to follow the operational testing plan it agreed to, it has failed to fund and test the equipment essential to conduct the tests. This includes no funding for flight-testing the Data Acquisition Recording and Telemetry pod, an instrument mounted to the F-35 that is used to simulate the aircraft’s weapons. This is essential for reporting and analyzing the results of each simulated weapons firing. There can be no such tests until the pod is cleared for function and safety in conditions that the plane will fly during the engagement and weapons testing. It remains to be seen whether or not the Pentagon and the contractors will continue to ignore the unpleasant information about the F-35’s performance in testing and the seemingly unending delays and instead attempt to create a false impression in the minds of the American people and their policymakers. The DOT&E’s latest report is yet more proof that the F-35 program will continue to be a massive drain on time and resources for years to come, and will provide our armed forces with a second-rate combat aircraft less able to perform its missions than the “legacy” aircraft it is meant to replace. The men and women who take to the skies to defend the nation deserve something better. Despite the conventional wisdom in Washington, the services do not have to be stuck with the F-35. Other options do exist. 1. To fill the near-term hole in our air-to-air forces, start a program to refurbish and upgrade all available F-16As and F-18s with life-extended airframes and the much higher thrust F-110-GE-132 (F-16) and F-404-GE-402 (F-18) engines. Upgrade their electronic systems with more capable off-the-shelf electronic systems. This will give us fighters that are significantly more effective in air-to-air combat than either the later F-16 and F-18 models or the F-35. Add airframes from the boneyard if needed to augment the force. Most importantly, bring pilot training hours up to the minimum acceptable level of 30 hours per month, in part with money saved by not purchasing underdeveloped F-35s now. 2. To fill the far more serious near-term hole in close air support forces, complete the rewinging of the 100 A-10s the Air Force has refused to rewing and then expand the inadequate existing force of only 272 A-10s by refurbishing/rewinging every available A-10 in the boneyard to A-10C standards. 3. Immediately undertake three new competitive prototype flyoff programs to design and build a more lethal and more survivable close air support plane to replace the A-10, and to design and build two different air-to-air fighters that are smaller and more combat-effective than F-16s, F-22s, and F-18s. Test them all against competent enemies equipped with radar missile and stealth countermeasures. These programs should follow the model of the Lightweight Fighter and A-X Programs in the 1970s, particularly in regard to live-fire, realistic-scenario competitive flyoff tests. These programs resulted in the F-16 and the A-10, two indisputably highly effective aircraft that were each less expensive than the preferred Pentagon alternatives at the time. And they became operational after testing in less than 10 years, not more than 25. 4. At an absolute minimum, the F-35 test program already in place that both the JPO and Gilmore agreed to must be executed to understand, before further production, exactly what this aircraft can and cannot do competently. That means suspending further F-35 production until those tests are complete and honestly reported to the Secretary of Defense, the President, and Congress. The F-35 program office has reached a crucial decision point. Bold action is required now to salvage something from the national disaster that is the Joint Strike Fighter. The administration should continue the review of the F-35 program. But officials should not just talk to the generals and executives as they have no incentive to tell the hard truth because they have a vested financial interest in making sure the program survives — regardless of capability. As this report shows, they are not telling the whole story. There are many more people lower down the food chain with other points of view. They are the ones possessing the real story. And, as the above suggestions show, there are still options. It is not too late to make significant changes to the program, as its defenders like to claim. Dan Grazier is the Jack Shanahan Fellow at the Project On Government Oversight, where this article originally appeared.